Nope–not one of those old comic book characters like the Flash or the Green Lantern. And I’m not talking about some perv in a green raincoat or anything like that. I’m talking about a green flash of light at sunset. Some people don’t believe in it. They think it’s akin to spotting unicorns or finding gold at the end of a rainbow but those people probably don’t believe in Santa Claus so that tells you everything you need to know about them. Let’s be clear, I am not talking about some kind of green after-image you can get by staring at the sun or a light bulb and then glancing away. I’m talking about a vibrant emerald ray of light that happens just after the sun sets on the other side of the world. First off is location. The other side of the world is a long way away so you want to make sure that nothing interferes with your line of sight. The best thing to do is locate yourself on an ocean beach. Pick a West coast beach, not an East coast beach. If you’re watching the setting sun on an East coast beach, there’re sure to be trees and maybe even mountains to clog up the view before the sun actually hits the horizon. That’s why I recommend a beach on the West coast, like Olas Altas beach here in Centro, Mazatlán. I won’t lie to you. Sure, other beaches feature the Flash but wouldn’t you rather view it from the place enjoyed by one of the Beat Poets over 50 years ago. 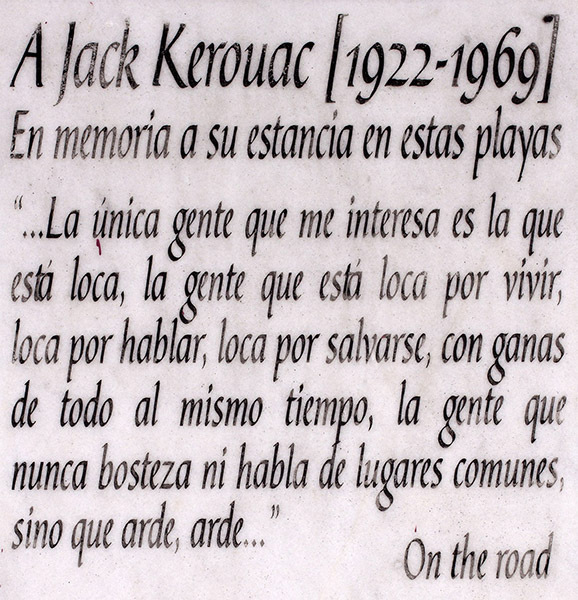 Members of the Beat Generation escaped to Mexico in the 1950s and there’s even a plaque on Hotel La Siesta’s wall commemorating Jack Kerouac’s visit here. Keep in mind the Beats, known for sexual liberation and experimentation with psychedelic drugs, could see flashes at all times of the day but you get the idea. 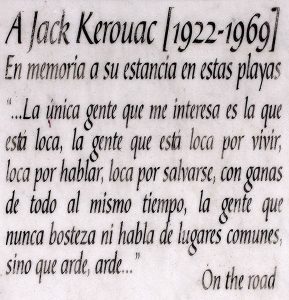 This plaque is on the wall of La Siesta. Be Forewarned. Pursuit of the Flash has its dangers. The danger is a bit delicate–it’s your companion. Sunset watching is not always a solitary affair. I don’t fully understand how this works but according to The Green Ray, an 1882 novel by Jules Verne, when one sees the rare green flash, your thoughts and those of others are revealed as if by magic. In his novel, clouds, flocks of birds, and distant boats eclipsing the sun, stymie tourists in search of the Flash. When the Flash finally occurs two of the tourists completely miss the big payoff because [Spoiler Alert] they looked away after discovering true love in each other’s eyes. 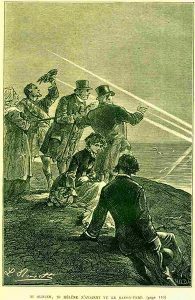 From Verne’s 1882 novel, Le Rayon Vert. Here’s the delicate part–that’s great for a Harlequin Romance but what if sparks aren’t on your mind. I’m just saying–be careful with your thoughts and whom you’re with. So, next is attitude. Waiting to see the Flash is kind of like fishing. You can spend forever waiting for that fish to bite but nothing seems to happen. The same with the Flash. You can watch a lot of sunsets and usually nothing happens. Oh, you can get some claimers who swear they’ve seen a Flash but these are the same people who spot a dark wave and scream they’ve sighted a whale breaching–then you squander ten minutes of your life staring at the ocean in what becomes a collective delusion. Try to avoid that kind of person. The Flash will only happen at sunset. Do not be tricked by what happens in Canada or the Northern States where sunset can be a drawn out affair. Contrary to what you may have been told, Mexicans are efficient and the time between sunshine and darkness is a matter of mere minutes. So if you’re uncertain as to when sunset occurs, there are technical journals to give you the exact time for any day of the year. Unlike fishing, if nothing noteworthy occurs this means you’ve only lost a few minutes looking for the Flash instead of hours frittered away in a boat or in a stream, gripping a piece of string with a hook at the other end and no bites. The next item to consider is preparation–not exactly of the Beat Poet kind but I’ll leave that for Part II. I’m accustomed to being rewarded with a conclusion at the end of your blogs. I would like to go on record as not being impressed with this “who shot JR” approach to blogging. I hope it’s not going to be a trend. Dear brother Bruce -Two things – just getting to read the blog should be enough of a reward for you and 2nd, “who shot JR” is so ancient that you should be embarrassed to reference it. Are you still using floppies?